What do New England and Dionysus (the Greek God of fertility and wine) have in common? A secret history of course! And possibly a fondness for chowder, though I have never had the opportunity to find out for sure. 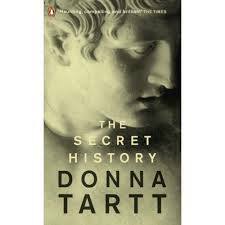 Before winning the 2014 Pulitzer Prize, Donna Tartt was known for being the mastermind behind The Secret History. This contemporary classic thriller starts out with a bang, literally. The story opens with a murder and dives right into the twisting chaos of a group of Ancient Greek scholars at an elite New England college who harbour a secret that reveals a passion for their studies…a passion for which they may be willing to kill. Perhaps the best review of this book is one posted to Goodreads, which states The Secret History to be “like drinking the scotch the characters drink in the book: smooth, sweet, smoky and scalding. You keep drinking, having no idea how drunk you’re getting. Then you try to stand up and the world falls out from under your feet.” While not a scotch drinker, I can still relate to the sentiment after delaying the writing of several university assignments of my own (sorry Professor Robertson) in order to devote as much attention as possible to this book. It is addictive in all the best ways. Also, it is available in print, ebook and eaudiobook to satisfy every reader.